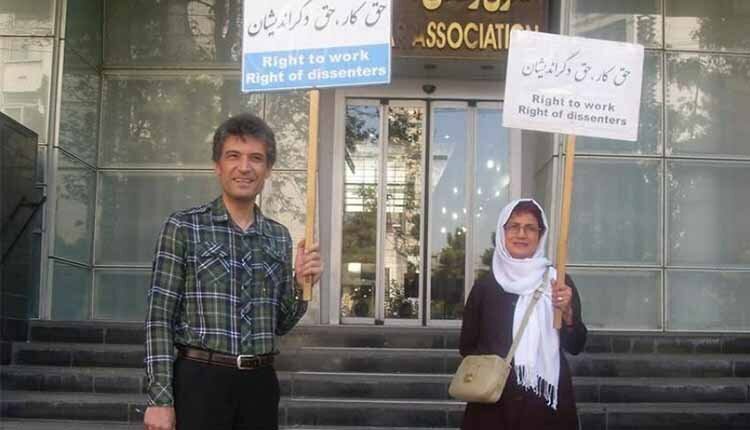 Undated photo shows rights activist and physician Farhad Meysami attends a protest alongside his friend and human rights lawyer, Nasrin Sotoudeh. Imprisoned Lawyer and human rights activist Nasrin Sotoudeh started a second hunger strike on Monday, November 26, 2018, protesting the Iranian authorities’ refusing to allow ill political prisoner Farhad Meysami to receive hospital treatment. This is the second time in three months Sotoudeh has gone on hunger strike to support Farhad Meysami. Nasrin Sotoudeh began a hunger strike in Evin Prison on August 25, 2018, to protest the authorities’ failure to respond to her demands. A 48-year-old physician, Meysami was arrested by agents of Iran’s Intelligence Ministry on July 31, 2018, for peacefully advocating against Iran’s compulsory hijab law. Upon raiding his home before arresting him, agents found badges that said, “I am against compulsory hijab,”which are now being used as evidence to convict him. After the arrest of Nasrin Sotoudeh’s husband, Reza Khandan, and the pressures on their family, he turned his strike into a dry one on September 8, 2018, and in a message from prison demanded the unconditional release of Nasrin Sotoudeh and Reza Khandan. On September 25, 2018, after deterioration of Farhad Meysami’s health, the authorities of Ward 4 of Evin Prison, transferred him against his will to a room near the prison’s health center, where he is being kept under watch and injected with IV fluids. Meysami’s imprisonment and the authorities’ refusal to allow him to receive proper medical care has resulted in the UN calling on Iran to guarantee the rights of Meysami, Sotoudeh and her husband Reza Khandan (also imprisoned). UN human rights experts have called on Iran to guarantee the rights of human rights defenders and lawyers who have been jailed for publicly supporting protests against the mandatory wearing of the hijab in Iran.